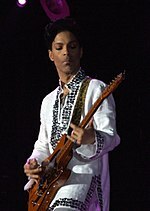 Prince Rogers Nelson (natus Minneapoli Minnesotae die 7 Iulii 1958; mortuus in suburbiis eiusdem urbis die 21 Aprilis 2016), mononymo Prince ('princeps') plerumque notus, fuit cantor, compositor carminum, multi-instrumentalista, alborum musicorum choragus, et histrio Americanus. Qui innovationibus musicis innotuit, atque operibus eclecticis, lasciva indomitaque persona scaenica, et amplissimo iactu vocali famosus erat. Late habitabatur praecursor soni Minneapolensis. Eius musica varia genera et modos coniungit, inter quos funk, rock, R&B, soul, psychedelia, et musica popularis. Pilkington, Ed, et Ryan Felton. 2016. "Prince: autopsy to be held after death of singer at Paisley Park." The Guardian, 22 Aprilis. Sweeting, Adam. 2016. "Prince obituary: ‘the music flowed out in an unstoppable torrent’." The Guardian, 22 Aprilis. Thiollet, Ioannes Petrus. 2017. « P comme Prince », in Improvisation so piano, Neva Editions, p. 91-96. ISBN 9782350552286. Vicimedia Communia plura habent quae ad Prince spectant. Novissima mutatio die 10 Martii 2019 hora 19:43 facta.